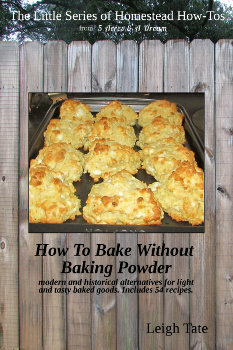 How To Bake Without Baking Powder: modern and historical alternatives for light and tasty baked goods. It is my most ambitious book in The Little Series of Homestead How-Tos so far, especially because I included a recipe section with 54 non-baking powder recipes. This is not a reprint of my "Baking With Wood Ash?" blog series. I reference that series, but the information here is so much more than that. Are There Substitutes for Baking Soda? Giveaway is over, but thanks for visiting! I'm really impressed that you've come up with 54 non-BP recipes as a result of your experimentation, Leigh! Wow! What a great reference book to have in any kitchen!!!! Great job!!! I'm interested in the book. I love reading I formation like that. Oh gosh, I had trouble limiting it to 54 recipes. Actually, once you understand the principles, the possibilities are endless! Thank you! Once I understood the "how-to," I stopped buying baking powder altogether. The research and experimentation for this book has been both fascinating and fun. I would love to get a copy of the book! Thanks for the giveaway! I never like baking powder on any of my baking. It is would be really neat to get a copy of your How To Bake Without Baking Powder book and start using your tasted ant tried recipes. Thank you. This would be a great book to have! I do use BP in many things, but to be able to get away from that would be awesome! I'm so happy to be a part of this blog; I just signed up! Would love to check out some new recipes without BP! Leigh - i just bought a copy. but i would like and if i win i would like to give it to someone else - is that ok? This is a must have. I love to bake. woops - that should say i would like "to enter"
I am here to say as a loyal blog reader, that somehow, you manage to make your published books into a whole other, richer product. The difference between Cliff's Notes and the original book of Gone With The wind. I just love your development as a writer. Would love to win a copy! 54 recipes ... wow. That sounds wonderful, I'd like to enter please, but honestly Leigh for $2.99, you ARE giving it away. Congrats... This book looks like a must have reading the content list this is probably the most extensive on the topic. Everything about baking interests me so, yes, I would like to win. Thank you. I love learning about new ways to modify recipes, especially when you have proven substitutes! I can't wait to read this. I want it for my wife please. I cannot be more impressed with your dedication to researching this. I've enjoyed your posts along the way! Thanks for joining in Peg. What a great giveaway. My Grandmother used to bake without baking powder all the time. I wish now that I paid better attention to her when she baked. All those lost recipes. She never wrote anything down. It was always, a pich of this a dash of that, fill the bowl this far up ith this or that. Thanks for the giveaway. Thank you for the opportunity to win! I think it would be interesting to give it a try. I would love to learn how to do all that kind of baking/cooking. Thanks for the opportunity to win it. Congratulations, Leigh! Please don't enter me into the contest (I'll buy a copy though!) -- I just wanted to pop in and congratulate you on the latest addition to your incredible library! have you ever turned your talents to such a thing as toilet paper substitutes? i read that people have used red cedar root fibre in the distant past. people are making cloth squares for the sub but i do not want a cholera epidemic. some of them think there will always be bleach available. we need to seek subs for things we don't think of because they are so ordinary to us. and ways to avoid diseases. i remember in anne of green gables that the bitter head teacher where anne taught spoke of growing up in the terrible atmosphere of smells in summer in big city poverty. we do not want to go that far back if we can avoid it. i don't have the facility for this sort of thinking, but i see that your great and very busy brain is poised for another project after resting from the baking powder epic. would you turn your mind to this t. p. project and other types of necessity production? i do anticipate there being plenty of newspaper ,at least for a while. so there is a source to replace wood logs for fire . godfather soaked them in borax h2o, i think, to stop sparks. he used them in the fireplace, but i cannot remember any details. deb - we have used "family cloths" for years. we use worn-out t-shirts (really soft) and cut them into squares. i keep 2 prettily-painted cat litter tubs in the bathroom, one on each side of the toilet. the wipes that we use are kept in one of the tubs and are moistened with water. once you use one, you put it in the other tub which has water and apple cider vinegar in it. when the used tub is 3/4 full, i take it out to the yard hose (during the spring/summer/fall) and spray down all of the cloths into our drain that hubby built. in winter, i take the used cloths and rinse them with the hose in the basement that empties into the same drain. hosing off the cloths gets most of the residue off of the cloths. then i soak the cloths again in water and apple cider vinegar for a few more hours and then run them through the washer (in winter) or scrub them by hand in spring/summer/fall. this has worked very well for us! this fall we plan to start making our own apple cider vinegar so that once our stores of it run out, we can replenish our stores. and there are tons of old/not-in-use anymore apple orchards around here where we can get the apples. That would absolutely be okay (and thank you for buying a copy!) If I draw your name, you can just tell me where to send the coupon code. Gosh Barb, that is the highest compliment I think anyone has ever paid me - thank you! I just hope it's an encouragement to others. $2.99 does seem like a steal, doesn't it? Pricing eBooks, however, is tricky, because eBook fanatics are notorious (in their reviews at least) for criticizing high prices. They know there's no print costs, so they assume the book should be dirt cheap or free. That's frustrating from an author's point of view, after spending hours, days, weeks, even months trying to produce a well-researched, well-written product. It makes me feel like they don't think my time and effort are worth anything. But who wants a bunch of one- and two-star reviews based on price alone? Oh my, I can so relate. There are so many things I wish I'd paid better attention to or asked my grandparents and great grandparents about. All the practical information and skills lost because we were too busy being kids! Deborah, excellent question, and one that honestly needs to be addressed. Kymber, thank you so much for joining in and for your truly helpful answer! Yes, this is something I've thought about, but no, it's not something I've got a conclusion about. When I lived in Arkansas, I remember some of the old timers telling us that's why the Sears Sears catalog was kept in the outhouse - for more than just reading! When my kids were babies, I refused to buy disposable diapers, but used cloth ones instead. I kept a soaking pail filled with water and borax, and of course the diapers got bleached in the wash. But as you point out, things like bleach (and borax) may not always be available. Kymber's solution doesn't use bleach, but she's still using pH to fight disease. That makes sense to me because all organisms have a specific pH range in which they can live. Changing that to too acidic or too basic will kill them. What's coming to mind now, is that it is fully possible to make our own "bleach," or rather lye water from wood ashes. Household bleach has a pH of about 12, and my ash water tested at about 12, so that might make a good soaking solution for family cloths. That's just off the top of my head! It's definitely a pertinent question, and one that needs to be addressed. Now the wheels are turning! My apologies for not responding to everyone's comment. For some reason my internet is slow as molasses since yesterday evening and it's taking forever to get the comment form to come up and then publish. I appreciate everyone who takes the time to leave a comment - even the brief "me too" ones. My readers are my encouragement and the reason I blog I write. Thank you! So exciting! I hope it sells well. I'm really interested in this topic. My wife loves to bake and I'm sure she would be thrilled if I could present her a copy of this book. Our grandmothers and in my case my mother(I'm almost older than dirt) used a wash-boiler to disinfect items after use. If you change the pH either up or down and then boil plus sunlight (when hanging out to dry) you will have sterilized the said item. The ultimate in sterilization would be an autoclave (pressure canner), which is how hospitals sterilize surgical kits. Basically good sanitation habits would keep most if not all infectious agents at bay. Looks like a very interesting read! I need to get a copy. May I just say, i am glad I found your blog! Very refreshing reads! Thank s for the chance Leigh and best of luck to everyone for the draw! 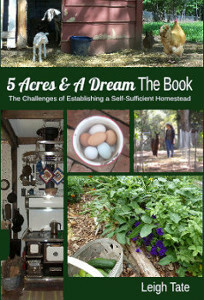 I'm not really an E-book reader myself, though I have ordered a few of Jackie Clay's homesteading books over the years. I like old school reading :), but in this day and age, I can see how it's important to offer an E version too. I didn't know that about the EBook fanatics...there are ALWAYS fanatics. No price is low enough anyway. Good luck with your EBooks, I think it's fantastic that you're sharing your knowledge. Nobody can squawk at that price! (or shouldn't). Judy, yes, excellent point about boiling! Thank you for mentioning that! Jackie Clay is has an amazing wealth of knowledge, so any of her books would be well worth it. I think some folks just like to be nit-picky and find fault. I've gotten some of the stupidest reviews for 5 Acres & A Dream The Book which do little more than reveal that the review hasn't actually read it! Maybe dinging a good rating is sport? I don't know, but I finally had to stop reading my reviews. Cool book ! This would come in handy! I'd love to try out these recipes. Thanks for the chance to win a copy of your book! Oh my gosh! I have to have this!! Whether I win or not, I'm buying this one!! thanks for turning the brain gears on about these questions. and to kymber for the vinegar answer. vinegar is said to be easily made, lye water also-taking precautions. my daughter told me her friend's mom uses vinegar water to disinfect kitchen counters, et cetera. i have always used bleach. did not know vinegar was so antibiotic. not to mention less expensive and less chance of injury. when i read about the 'family cloths' i think 'cholera!'. i only used cloth diapers, don't think 'plastic' diapers are sANITARY FOR BABIES. HaD SOMETHING FROM MONTGOMERY WARD THAT WAS A THIN RAYON 'CLOTH'. PUT IN DIAPERS AS A LINER TO CATCH THE WORST . THESE COULD JUST ROLL OFF THE CONTENTS into the toilet. sometimes just threw them away if they were very filthy as they were inexpensive..
then all were soaked in biz and hot washed. i never let them sit around. baby's health, don't you know. favorite modern accomplishment --indoor running hot and cold water, and water and sewerage treatment plants. thank God for them, but in an emp or terrorist attack they may not run anymore, so want the wisdom of the ages for alternatives. the Bible says of the israelites in the desert that everyone was to take a spade and cover his sewerage with dirt. this kept disease away. not a bad idea for modern times if there is a prolonged interruption of services. ours was acting up and the phone company has been working on the lines all over this area. maybe they are messing with yours, too. Oh my, I am forever impressed with your research abilities. this is wonderful. Very likely. I finally reset the modem and that seemed to take care of it. Then this morning I had the same problem again, which was also resolved by resetting the modem. At least I know to do that! 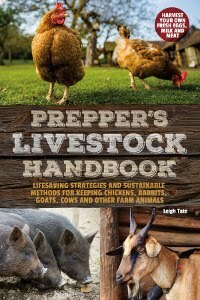 This is definitely an important prepper topic, although it's not one folks seem to think about much (except adding "toilet paper" to the stock-up list.) Some of it just seems to be common sense, but folks don't even seem to have that any more. I mean, how many times has any of us used a public restroom and been aware of folks walking right out from the toilet and not washing their hands! Maybe we're so scientifically advanced that we don't need to take simple sanitary precautions any more??? When I lived in Arkansas we had an outhouse and kept a bucket of wood ashes from the cook and heat stoves in there with a scoop. After each use some of the ashes were sprinkled down the hole. This helped keep flies away and fly larvae counts down. I think this might make a good topic for another "How-To," what do you think? that's one other thing i wanted to mention - boiling water. i put our family wipes in boiling water (you can do this over an open fire) and let them sit in the boiling water until the water cools down. once the water is cool enough to handle, then pretty much all residue is off of them and then i wash the wipes using our own soap made from shavings of ivory soap bars and hot water. in a grid-down or any other kind of event - i would use wood ash. as an example - let's pretend the whole world shut down and i ran out of my 1,000 bars of ivory soap. let's pretend it's winter. we would use our outhouse. we would also use a bucket in the house. the cloths would go into a bucket of melted snow with or without apple cider vinegar and/or soap shavings (i have a LOT of ivory soap stored). we would melt snow to boiling on an outside fire. we would put the wipes into the boiling water and let them sit. if we had no ACV or soap we would use wood ash to scrub them. and then, using a fire, we would take the cleaned wipes and boil them again. we have thought through a bunch of these issues...and the good thing for us - is that we have had access to a variety of people here in the community who are 100 yrs old and older and we have specifically asked them what they and their parents used to do. Kymber, that makes a whole lotta sense! Very well thought through and very practical. And what a fantastic resource your elderly neighbors are. Good on you for asking them! Actually, vinegar isn't that difficult to make, whether it's from apples or some other fruit. It's a natural souring of fruit juice, as long it hasn't been pasteurized. With any abundance of fruit vinegars could be made. I was thinking cranberry vinegar, but that might need some extra sugar for the lactobacilli to do their job. All this is bringing back memories. Another memory from living in Arkansas (in my back-to-the-land days), if we were out hiking and ran out TP (always carried in the pocket) we would look for mullein leaves before running off with our little trowels. Not as soft or absorbent as Charmin, but it was useful in a pinch! This sounds both fascinating and useful! Great job!! Ooooo - me, me, me!!! :) Sounds like a great book to have on a farm. would love a free copy of your book, I am very interested. Thanks and God Bless. Sour Cream Or Crème Fraîche?